In this post of Homeo Expert, we shall discuss the best Homeopathic medicines for fever. When you feel an increase in your body temperature then it means that you are suffering from fever. If you are suffering from fever, it shows that something abnormal is happening in your body. For a young man, fever is uncomfortable and he does not pay attention to it until it reaches 103 F (39.4C) or higher. In case of infants, a slight rise in temperature is an indication of a serious infection. Fever is a seasonal feeling which can attack everyone. You may take a pill and it will bring down the temperature of your body, but the infection will remain present in your body. Therefore, the role of homeopathic treatment for fever is necessary because they are made from natural substances. Homeopathic field gives a different course of medical approach and these natural remedies get rid of the infection. It means that they get rid of the root cause of a fever. So when the temperature rises in the body, the fever comes into existence. Fever is not a disease but it informs us that there is an inflammation or internal infection in the body. Homeopathic medicines for fever do not bring down the temperature but they target the infection in the body. It is because the temperature of the human body rises due to the infection inside the body. When the temperature of fever increases it means that the infections are also increasing whereas the decrease of the fever indicates the infection is also disappearing from the body. 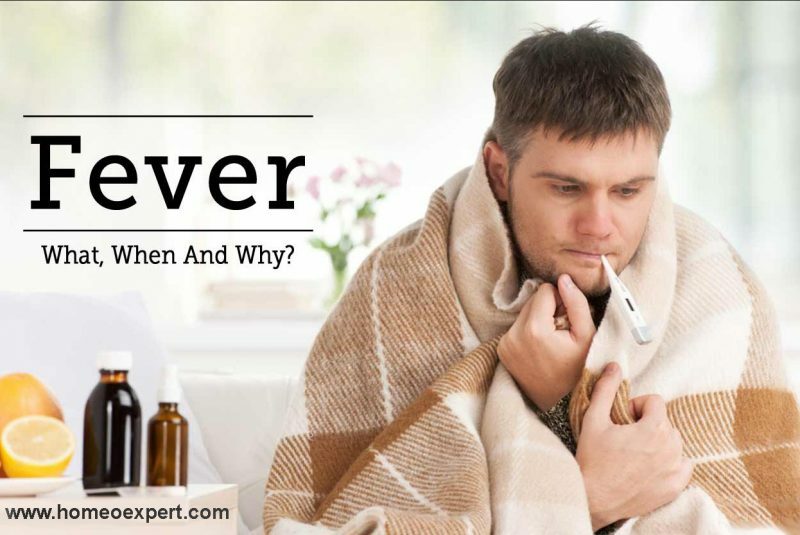 If the fever instantly fades away without stopping the infection process, we will unable to find what is going on in your body. End of the day, the temperature will be gone but the infection is still inside the body. Natural homeopathic remedies prevent the infection from development and the temperature automatically decreases when the infection reduces. Homeopathic medicines also take care of the weakness comes after the fever. We have a large number of natural medicines to deal with fever or temperature cases. We suggest homeopathic medicines according to the symptoms and every patient has different symptoms. There are some other causes of fever too. When your body temperature rises from the normal range, it shows that you have a fever. The average range of normal temperature is 98.6 F (37C). We suggest Bryonia Alba when the symptom of body ache occurs during fever. The patient of this medicine wants to lie down in order to get relief and a little movement increases the symptoms. But there is no increase of thirst for water in the patient. Aconite is a natural Homeopathic remedy and it is helpful in a fever when it occurs with extreme restlessness and anxiety. There is an increased thirst for cold water and the pain in the body is unbearable. We should consider Aconite when the patient suffers from fever after a sudden exposure to cold winds. We consider Homeopathic medicine Nux Vomica as holistic medicine for fever. It is due to the reason that they are made of natural substances. That is why we use it in cases of shivering and chilliness. The patient of the medicine wants to cover him at every stage of the fever. We use this natural homeopathic remedy for fever when the patient feels dizziness, weakness which is accompanied by a tendency to faint. The patient does not feel thirsty in most of the cases. Homeopathic medicine Belladonna is the best natural remedy to get over fever which comes along with pain in the throat. The symptoms of this patient include red eyes, excessive heat with high fever and pain in the throat. Rhus Tox is one of the top natural Homeopathic medicines for patients who face extreme body aches along with fever. It also leads to restlessness. The patient of Rhus Tox wants to remain in motion to get relief from symptoms. When someone gets fever due to getting wet in rain, Rhus Tox should be used in these cases. Merc Sol is another natural Homeopathic medicine for fever where the patient has excessive saliva in his mouth along with sore throat. Hepar Sulph is also a helpful natural Homeopathic medicine of fever with a sore throat, especially when the patient feels pain in throat along with an extreme cold. The best natural Homeopathic medicines for Septic Fever are Pyrogenium, Lachesis and Anthracinum. Note: again, we want to tell you that we suggest homeopathic remedies for fever after taking a complete case history from the patient. Therefore, these homeopathic medicines should be used carefully. Septic fever cases are a critical one and may prove fatal so do not self medicate. Wash your hands after eating, using toilet or meeting after a sick person. Guide your children to wash hands after traveling or petting an animal. Do not touch your nose, mouth and eyes because it can lead to body infection. The viruses enter the body when you touch your mouth, nose and eyes because they are their main ways to enter. Cover your nose when you sneeze and cover your mouth when you cough. Avoid sharing water bottles, cups and utensils.